Nintendo released an update to both Smash brothers for Nintendo 3DS and Wii U games today on the eshop . Once you update the games they will be version 1.06 and allow you to download the new DLC and costumes. 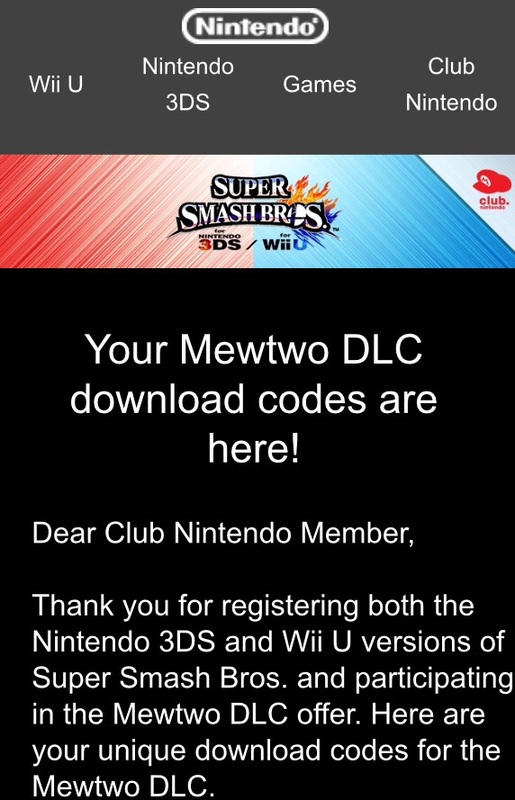 Nintendo has sent out email codes to Club Nintendo owners of both games for the character MewTwo as a playable fighter . If you didn't qualify for this Club Nintendo promotion you can buy MewTwo in about 2 weeks. You can buy DLC for either game or both and the code will be presented in the digital receipt for the other game. The process is a little strange to get DLC for both systems. I got Majoras Mask and Link Mii costume for Mii fighter and will download MewTwo later today. The update also changes the balance of characters and adds more sharing functions to the Wii U version.